Side swept bangs can be a great addition to any look. You can style them near countless different ways, making them a great choice for any occasion, and you’ll be pleased to know that depending on how they’re cut they suit almost any face shape! You can have them cut and styled so they look delicate or heavy, long or short, you can have them dramatically sweeping across your face or even simply go for the subtle look. I know some girls who love to hide mysteriously behind their side swept bangs while others love wearing their bangs short while still going for the side swept look. It really all comes down to personal taste and what will suit you best on a day to day basis. Not all styles are formal enough to pass off in the workplace while others only suit the workplace. Seeing as not all styles suit every occasion you ought to keep this in mind when choosing a style – it’s likely that you may even want to pick a few styles or one very versatile style to best fit your needs. That said, here are fifty great side swept bang hairstyles, enjoy! Here Rihanna is wearing a gorgeous long pixie cut but instead of letting her side swept bangs drape over he face she’s styled them so they sit up high before sweeping back behind her ears. This is a fab look as it shows off all of hr face instead of hiding it. This look works best for those of you with slim face shapes such as oval or hearts. Another great thing about this look is that it’s very versatile and you can wear your hair like this whether you’re heading out on the town or simply going to work for the day. The only downside is that you have to set your alarm clock five minutes earlier every day as this style isn’t the easiest one to master in a hurry. I used to thing that you could only have side swept bangs if you had a side parting, something that really annoyed me as that’s a look that simply doesn’t work for a lot of people. Thankfully however, that myth is far from true and you can easily compromise be wearing a zig sag parting to give you the best of both worlds as Sophia Bush has done. She’s wearing her bangs long so they sweep across her eye, a look that is great for partying however if you’re heading off to work you may need to clip your bangs back out of your face. There’s no hard fast rule that says bangs have to be straight and sleek. In fact they can be anything but and yet still look amazing as Hilarie Burton proved year after year when she starred in One Tree Hill. She rocked the classic perm look and even had her bangs permed, making for a fantastic stand out style. This is a great look for absolutely any face shape and any occasion so why not take the plunge and ask your stylist for a perm? Here Cameron Diaz is wearing her side swept bangs long so that they reshape the look of her face. To save her look from becoming dull however she’s subtly added a flick to the ends of her bangs using curlers, something which is in complete contrast to her tucked under bob, which really adds an edge to her look. Again, this is a great style for work of play however flicked long bangs don’t work for every face shape, they look best on round or square faces. Sophia Bush is once again rocking her side swept bangs and this time is still wearing them long but has gently curled them to add a bit of texture to her look. This takes her look from plain to exciting with just a sweep of her curlers. This is definitely more of a ‘play’ look and sadly likely won’t pass for long days at the office. If you’ve got a heart shaped face then this hairstyle is for you! Cameron Diaz’s style here is pretty iconic when it comes to side swept bangs and you only need to look at her to understand why! Her long sweeping bangs perfectly shape her face while not hiding away her eyes. Having side swept bangs so long is a great option as it means you can style them loads of different ways and even tie them back when you need to. Her highlights look fab too and really add a new dimension to this classic look. Sadly this isn’t a great look for round or square faces but for all the rest of you then jump right in! I’m sure we can all appreciate how fab Rihanna’s side swept bangs look her – in fact her whole style for that matter! She has her bangs pulled over her eyes to make her look mysterious however the look isn’t too overpowering as she’s curled her bangs along with the rest of her hair, giving it a lighter feel. Her bold red colour really makes her stand out and goes fab with her curls. This isn’t what you’d call an office look but if you’re heading out with friends then grab the curlers! Choppy bangs are a great way to give your look a bit of texture and eve a bit more volume if it’s done right. By simply adding a few layers you instantly change your look. To make the most of this style don’t smooth your bangs over to make them look sleek, ruffle them up a bit and hold them in place with a touch of hairspray to make them stand out. This is a great look for any face shape and you can even alter your look by growing your choppy bangs long or having them short. Valorie Curry looks fabulous with her pixie cut and even better when she wears her bangs to the side like this. Her side swept bangs are very short but this adds a cute factor to them and makes them really easy to maintain and style. This look is best for people with slim face shapes such as oval or heart shapes and can be work for any occasion. These cute bangs look best with a pixie cut however if you feel like experimenting you can try them with longer hair too. I loved having side swept bangs but couldn’t help but be annoyed when they fell in my face. This doesn’t seem to be a problem for Natalie Dormer however who’s subtly sept her bangs off of her face and pinned them behind her ears, making for an elegant look. This is a great style for any face shape and is perfect for work, play, or even the red carpet! Ir your bangs aren’t as long as Natalie’s you can still experiment with this style and pin your bangs to the side higher up too. Loose waves are a great way to add a bit of texture and volume to your style without overdoing it. Unlike curls, waves suit any face shape and they make for great bangs, especially if they’re as light as Rachel McAdams’. When you’re styling your bangs make sure not to make them too thick or else this will ruin your look. Less is more as they say! Don’t worry if all your waves aren’t the same either, having them all odd in size will add to your look and make you look carefree. This is a perfect look for daytime or nighttime. Side swept bangs don’t have to be dramatic to look great either. Take Dianna Agron’s look here for example. Her bangs sweep only a tiny bit yet they still look fab. This also makes for a great look as it can be altered to be a full fringe too. If you’re heading to work then this may just be the perfect look but it’s also cute enough to look great on a night out too. These long bangs look so cute, especially when they flick at the end. This is a really stand out style and can instantly transform you from Plain Jane into a rock chick. This style of bangs looks great with choppy hair and highlights as it has so much texture in it. Don’t worry if it keeps falling in front of your eyes – it’s all part of the look. This is a perfect look for any face shape and can be styled in numerous ways to suit a variety of occasions (though the office may not be one of them!). Kristen’s blunt cut really does make for a refreshing change. It really draws attention to her bangs to highlights her pretty face. My best tip for this look is to keep your bangs straight or else the blunt cut won’t show up as well and the look will be lost. A few highlights are also a great way to draw attention to this unique style. This is a great loo for everyone so don’t be afraid to get styling. Instead of opting for short heavy bangs, Candice has created a totally unique look by wearing her bangs long and very light. As her bangs sweep across her eyes they add an air of mystery however her look is still very inviting as her bangs are nice and light so you can see through them. This look is perfect for if you’re going to a party however more formal occasions may be out. This is also one of the few all round styles that can be pulled off by any face shape. Here Hilarie Burton has gone for a very subtle approach to side swept bangs. Her bangs sweep across her forged only slightly and fall heavily on her face, making her look edgy, mysterious and stylish all at once. This is a really easy look to maintain and is a perfect look for socialising. It works with any face shape apart from round or square faces. Never fear that if you have side swept bangs they’re going to be constantly falling in your face. There are plenty of ways you can experiment with to style them to one side. Braiding your bangs back is incredibly simple and makes for a fabulous look which you can wear for socialising or for work. The only occasion this look may not work for is a more formal affair however there are variations of this look which you could experiment with in this case. Here Reese is wearing her bangs long which means they’ll be forever moving and her look will be constantly changing. This is a very easy look to create and style which is great if you’re constantly lacking of time. If you like this look then why not try experimenting with your parting too. This look is dramatically changed depending on your parting position so it’s worth playing around to see what suits you. This look suits any occasion or face shape. This is the perfect look for any formal occasion as it’s screams elegance and style. Hilarie has subtly curled her bangs into one curl, twisting the hair away from her face so her eyes are left clear. You can try this trick even if the rest of your hair is straight as it makes for a lovely contrast however as you can see from Hilarie it looks great if all your hair is curled. This look is best on heart shaped faces however don’t be afraid to try it out even if you have a different face shape too. Gentle waves is a great way to spice up your bangs, especially if you have a delicate face shape. This look is easy to create and looks best if the rest of your hair is curled too. If you’re heading out to a formal occasion then this look will be perfect but it’s also one I love wearing socially too. This look also really suits the addition of hair accessories so don’t be afraid to experiment with your look and see what you like. If you’ve got a full fringe and would like to experiment with side swept bangs then this is a great option to get you started. Simply start off with a full fringe and gently guide your hair over to one side then keep it in place with a touch of hairspray. This is a great option if you have thick hair or simply a heavy fringe and is a perfect look for any occasion. Sadly, this look doesn’t work for people with round or square faces as it makes their faces look shorter and wider but all the rest of you will look fabulous. Dianna’s look here is great, especially as her bangs only just skim her eyes. Her thick hair makes for heavy bangs but luckily the length of them means they don’t fall in her eyes too often and they skim nicely around the side of her face. This loo works well if the bangs are slightly feathered at the bottom and is really set off my the addition of highlights. This look works really well for round and square faces as it frames the face without risking making it look too wide. Katy Perry’s side swept bangs look great as they make a statement without altering her style. She’s wearing them tucked in amongst her other hair so they still frame her face and give her a side swept bang look. This is a perfect look for any occasion. The only face shape it wouldn’t work on is people with a small forehead (like me!) as the hair won’t fall right around your face and will fall over your eyes instead. Wearing your bangs long is great because it means for formal occasions you have the option of sweeping them back like Kiera Knightley has. This look is best done if you keep your centre parting and leave your bangs a tiny bit loose. This is a perfect style for heart shapes faces but it also looks amazing on round a square faces too. This style of bangs is perfect for wearing with a bob like Victoria Beckham here. Victoria’s bangs are really light thanks to her thin hair which means they don’t obscure her vision as they fall gracefully across her eyes. This is a great look for hitting the social scene with ad will instantly liven up your bob. It also suits longer bobs and a line styles, especially if you have a delicate face shape like our former Spice Girl has. Here’s another great side swept bang look to go with your pixie style. 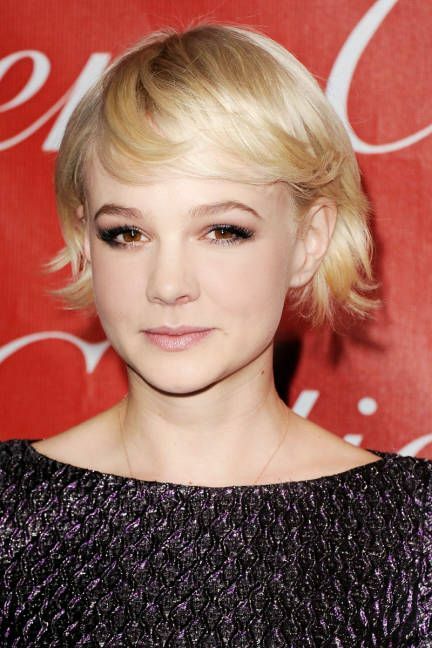 Carey has styled her short bangs so they lick gracefully to the side, subtly adding a new dimension to her look. This look doesn’t work for round faces however look amazing on heart shapes. If you’re looking for a perfect all round look then this option is definitely worth considering, especially as it’s easy to maintain and you won’t have to spend ages styling it each morning. Long waves for side swept bangs is always a winning look as Emma Stone proves but she’s also made it look even better by pinning the other side of her hair back behind her ear so her bangs become the main focus of her look. The waves add volume if you have thin hair and take your look from plain to chic in an instant. You can use curlers to create this look but personallyI think that braiding your hair a few hours before hand will create the best wavy look possible. 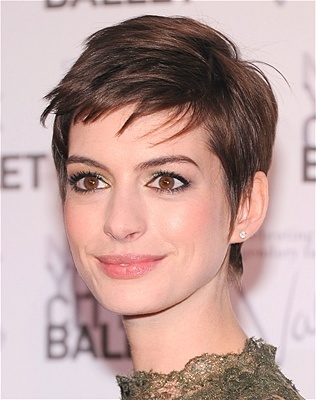 Here Anne Hathaway shows off her fabulous side swept bangs with her pixie haircut. Her bangs are very short but as she’s wearing them rather choppy it doesn’t matter. Her rugged look really suits her pixie style and is easily maintained for those of you with not a lot of time on your hands. This is a perfect look for any occasion and suits any face shape. Here Rachel McAdams shows off her beautiful thick bangs which she’s wearing long and swept to the side. This is a truly classic look that requires minimal styling and is one which you can pull off at work, while socialising, or even on the red carpet. You can try out this style of bangs no matter what your hair length is too so don’t be afraid to experiment. Heart and oval shapes suit this style best of all but some square faces will also look fab! Of course not all looks need to be neat and nice as Dianna Agron proves here. She’s gone for a very choppy and rough look which makes her look like a bit of a rock chick. This look is a easy to create and all you need is a bit of styling product and some hairspray to get going. Sadly this look doesn’t suit more formal occasions so you may need to save this look for nights out. It also doesn’t suit all personalities either and you need to have a fair bit of confidence to pull it off. Still, if you’re looking for a wild look then this style of bangs is perfect! Katy Perry’s bangs make for a great casual look. They’re the perfect length to sweep around her eyes and frame her face and aren’t too heavy or too light. This is a great look as it enables you to wear your hair up or down without spoiling your bangs too meaning it’s perfect for wearing at the office or even on a night out. This is perhaps my favourite all round look. Its great for heart and oval shaped faces, though you’ll also be able to pull it off almost as well if you have any other face shape too. I simply adore this look and think that everyone should try it at least once! Here Jen’s bangs may be extra long but don’t let that fool you, they’re still perfectly side swept. As her bangs are so long they’re extremely versatile and she can style them most any way she wants, giving her a tonne of freedom. If you’re looking for a look that won’t restrict your styling options then this is a great choice. It also works for any face shapes and is a great style for helping slim down the look of your face. You can also try this style of hair lengths from medium to extra long so don’t think you have to have hair the same length as Jen’s to try this out. Adding just a subtle sweep to your bangs can completely change your look. This is a great style in between having a full fringe and having side swept bangs meaning it’s incredibly versatile and you can style this look a few different ways. It’s great for any face shape apart from round and you can wear this look to any occasion. Plus you can alter it by wearing your hair up or down too so be prepared to get experimental. I don’t know about you but every now and again my bangs start to annoy me. I love them but when they fall in my face I can’t help but get a little irritated. If this is a problem you know well then this is a great style to combat it. By simply pinning your bangs back you completely change your look and suddenly your pretty face becomes the focus of your look. Why not experiment with this look and add a braid or a hair accessory to really make the most of the pinned back look? 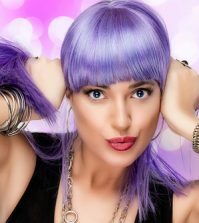 Kate Voegel’s bangs look thick but it’s only the colour of her hair that creates this illusion. They’re actually blissfully light and delicate which makes this a much more manageable look. Note how her bangs only just skim her eyes and the way they curve around the face to highlight her features. Her style is very easy to create and incredibly easy to maintain so you don’t have to have loads of time on your hands to look as good as Kate does here. If you’ve been reading my other posts then you’ll likely know that I love any style which has been slightly wind blown. I think it looks great as it adds a little edginess to your look and stops you from looking like a Plain Jane. Don’t worry, you don’t even have to step outside to create this look either. All you need is a bit of styling product, some creativity, and a can of hairspray and you’re golden. By backcombing your hair a bit you can also make this look even cooler too, especially when it comes to your bangs. Windswept bangs are incredibly easy to create and they look fabulous! In complete contrast to the last picture we now see Hilary Duff with extremely near bangs, a style which is perfect for hitting the office with. This style is great as you can wear it with your hair up down, windswept, curled, anything! It also looks great on all face shapes too making this a truly versatile look. Hilary’s bangs are the perfect length as they sweep across her brows and don’t hide her pretty eyes from view. They highlight her face wonderfully. Here’s another great look from Kristen Bell and this time she’s showing off her fabulous pixie bangs. Her bangs taper beautifully to the side, showing off the majority of her face which still drawing attention to it. I’d also like to note how the rest of her hair perfectly frames her face too. This is a great look for round faces and is perfect for most any occasion. I love this look on the one and only J.Law. It’s cool, it’s chic, it’s edgy and it’s certainly unique. Wavy bangs like this aren’t the easiest style to create I’ll admit but once you get them right they look fantastic. Always remember to finish this style off with hairspray or your bangs will no doubt be falling back across your face in hours if you don’t. This look is perfect for oval faces and looks great for hitting the social scene. This is one of my favourite variations of side swept bangs and is the perfect look for any formal occasion! This works best for pixie cuts but with enough hairspray you can make this look work for long hair too. This is a great way to instantly transform your look and get your bangs out of your face for the evening while still looking utterly fabulous. This is definitely a win for Carey Mulligan. While colouring your bangs isn’t exactly a style I think it’s definitely an option worth considering as it instantly transforms your look and makes you stand out in a crowd. You can go bold like Rachel McAdams or you can go for a more natural colour but either way even just a tiny change will refresh your look and have you feeling and looking your absolute best. Hilary Duff’s bangs look great here. All she’s done is straighten them and sweep them ever so subtly to the side, giving her an edgy chic look. This is a great party look and definitely looks best on people with delicate and long faces. I’ve been told by hairdresser friends that this is the most common picture of side swept bangs that they are presented with in salons. It’s the style that loads of girls want. The reason? Firstly is looks amazing! It’s chic, edgy, versatile, and suits all face shapes. Secondly, it’s very easy to maintain once you’ve got it due to it’s subtle nature. This is an awesome look for social events and you can keep it looking great throughout the day with very minimal amounts of effort. Rachel’s look here doesn’t have what I’d call wavy bangs however there is a slight wave to her bangs which is where the title came from. This wave gives her hair volume which still keeping her look incredibly simple. More like than not this wave is natural meaning this style is very easy to replicate, even if you have just rolled out of bed. This look is fab for any occasion and this style of bangs will flatter square faces most of all (though I encourage you to try it still if you have a different face shape!). Taylor Swift has two layers to her bangs here, one of which overlaps the other creating volume in her look. This look is simple to create yet very unusual which will help the wearer stand out in a crowd. You can also alter this look so it looks great at any occasion, a definite pro. Oval face shapes will look the best with this fab style. 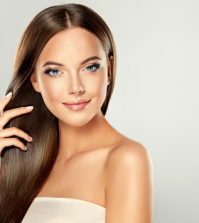 Simple sleek bangs are a great option, especially if you’re likely to be spending a lot of time in a work or formal environment. They’re very easy to manage, especially at this length which will really flatter any face shape, and they’re also nice enough to wear socially too. You can style them by adding a curl or some waves for other occasions too. As Gwyneth shows, this type of bang is perfect for wearing with your hair up, especially if it’s nice and straight. Your bangs don’t need to look perfect all the time – in fact sometimes it’s better if they don’t. I love Emma’s long side swept bangs, especially as they’re a little bit rugged which adds an edge to her chic style. This look is perfect for formal occasions and by simply letting the rest of your hair fall loose you’re instantly transformed and ready for social occasions too. This is a really easy to create style too which gives it some serious bonus points. Just simply adding a few highlights to your bangs will instantly transform your whole look. It’s a great way of brightening your face and making your bangs go from boring to alive. You can also get lowlight too but in my experience highlights gives the better effect when done on bangs. Try not to stray too far from your natural colour as this may spoil your look, instead keep it subtle for the best results. If you’ve got long bangs you’ll likely constantly find yourself running your fingers through them and sweeping your face, something many people find annoying but something which leads to this ace style as Kaley shows us. When pushed back long bangs fall perfectly around your face and look great if you have an oval shaped face. Any finally we come to our last style sported by Emma Stone. Her long sleek bangs are great and are a truly versatile style. They’re neat enough to wear to work and still chic enough to wear for a celebration too. Wearing your bangs long like this gives you lots of styling options too so you’re not restricted to the same style day after day. I hope you’ve enjoyed this article and that I’ve helped to give you lots of inspiration. I’d love to know which styles were your favourites and if there are any you’re planning on trying out so don’t hesitate to get in touch. Are there any styles you didn’t like or any you can’t wait to try out? Personally I loved all of them – in my book any bangs go so long as they suit your face shape and the occasion. Like I said at the start, not all bangs suit every occasion so bear this in mind when choosing a style and perhaps go for a very versatile one or a style you can easily change. Happy styling and don’t forget to comment with all your thoughts! I was wondering who is the first (top of page) picture is of or how I can find her. Im trying to find a style I would like for myself for sideswept bangs and I like hers. Any advice? I have a heart shaped face. I believe that that picture is Rihanna. She is a singer who is known for having a very unique style. If you need more ideas, just check out the pictures on the page. 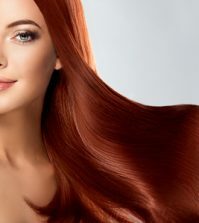 If you bring the picture to a hair stylist, they should be able to cut your hair just like it–and tell you how to style it so that your hair actually looks like the picture. Have not seen the inside of a salon for about 9 months this February 7.
another three months and it will be 12 months.have been looking at various styles .I’ve come to one conClusion. If I lived in a studio for the rest of my life I would look like that and I would be hassled by other women while I’m busy growing my hair.sso I think I won’t bother looking at pictures and I will decide what looks good after all I should know.iknow.ive been living in the body I own for 46 years.syears.so there. That seems like a very long time to go without getting a haircut! A trim will help your hair to grow a bit faster. If you are super talented, you can always cut your hair or do your bangs at home! I cannot get over my love for side swept bangs. They remain my favorite way to style my bangs. It is great to see that other readers enjoyed this list as well.